Guten Tag! 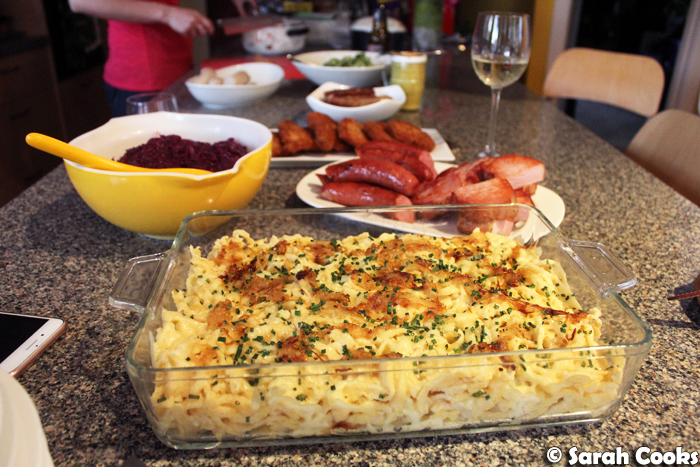 A couple of weekends ago, we hosted a fab German dinner for some friends and family, a total Sausagefest, if you will. This was a thank-you dinner for our friends who kindly gave up a Sunday in January at the last minute to help us move a fridge up a flight of stairs. What legends! We were so appreciative and we really wanted to make it a feast. We thought it would be the perfect opportunity to showcase some German home cooking - one of our friends Suryadi is obsessed with Kassler (smoked pork loin), and our buddy Aditya is a big schnitzel fan! Why not introduce them to some other great German food too? I'll translate all the German words below (with pictures! ), but basically there was a lot of meat, plus some red cabbage, a cucumber salad, and a big vat of cheesy Spätzle pasta. Sehr lecker! We wanted to serve a big range of different things they might not have tried before. If anyone is curious, we got all this meat at the Wursthütte, a great Swiss butcher in Malvern. They have heaps of Swiss and German meat products - smoked sausages, meatloaves (Fleischkäse / Leberkäse! ), cold cuts and more! They also sell some German grocery items - mustards, spices, flavouring packets, that type of thing. Love! We tend to go once every few months and do a big shop whenever we're craving some home-style German food. Working clockwise from the top left, we have Kassler, or smoked pork loin. This basically tastes like bacon steak. 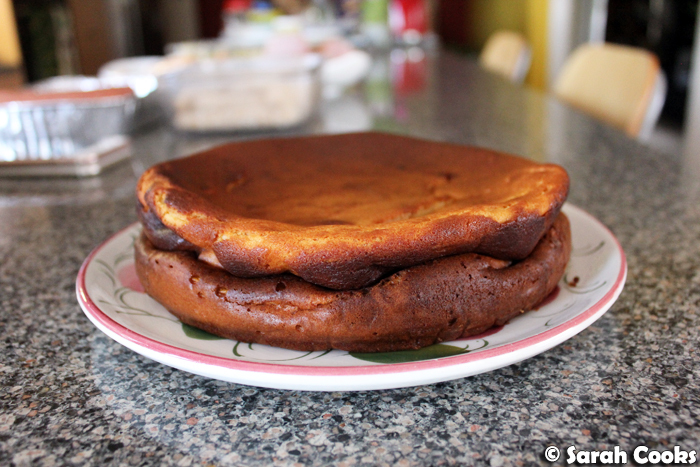 We fry it in a pan for a few minutes each side until golden brown and heated through. 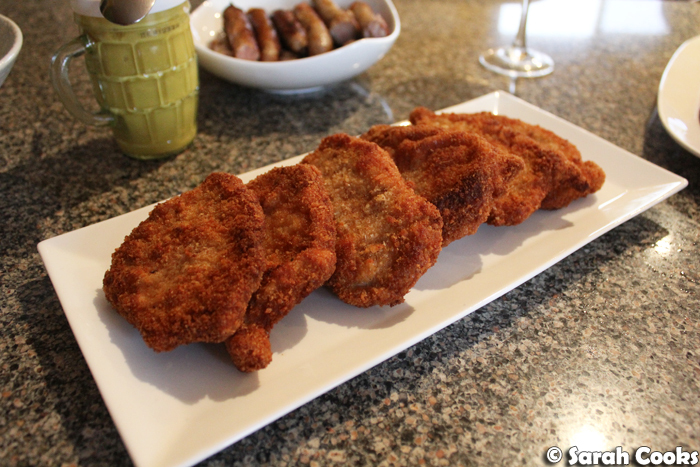 Top right are pork schnitzels, made of regular raw pork loin fillets. I got the butcher to bash out the pieces for me slightly (not too thin, we want a thick German schnitzel, not a thin Austrian schnitzel! ), and I floured-egged-and crumbed them at home. In the bottom right in the foil tray, we have cheese kranskys (smoked pork sausages filled with cheese, also known as Käseknacker), and the light coloured sausages are Bratwurst (raw, unsmoked pork sausages). 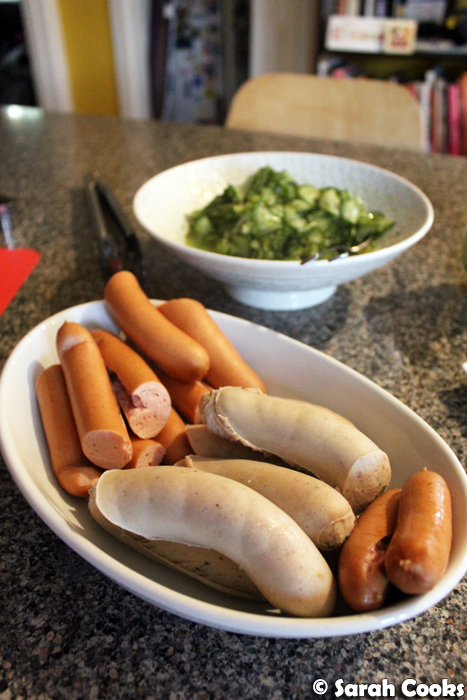 In the white dish on the left we have Frankfurters, a smoked pork sausage, which are your typical hotdog-type sausage. 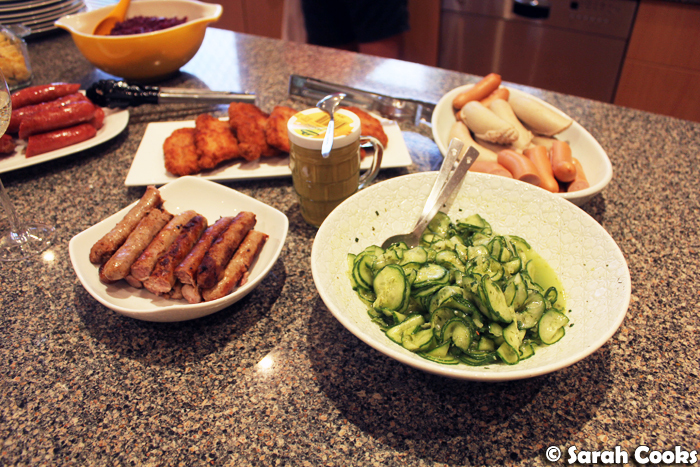 And finally, the white sausages on the left are Weißwurst, a Bavarian veal sausage with a smooth texture. We hosted the dinner at my parents' place (more space, and they also assisted with the fridge! ), so we went shopping in the morning, prepared everything at our place, (like crumbing the schnitzels, baking the cheesecake, making the salads), then transported it all to my folks' place to cook. A few tips for any fellow sausage-enthusiasts or those who are interested in learning more about German sausages - raw sausages like Bratwurst must be cooked; smoked sausages can be eaten cold, although I prefer them hot. (If unsure, check with your butcher). In terms of cooking methods, Bratwurst and cheese kranskys are best fried in a pan or cooked on the barbecue, and Frankfurters and Weißwurst are heated through in gently simmering water. Don't let the water boil too hard or the sausages will split. (The sausages will still be edible if they split, they just look nicer if they don't). 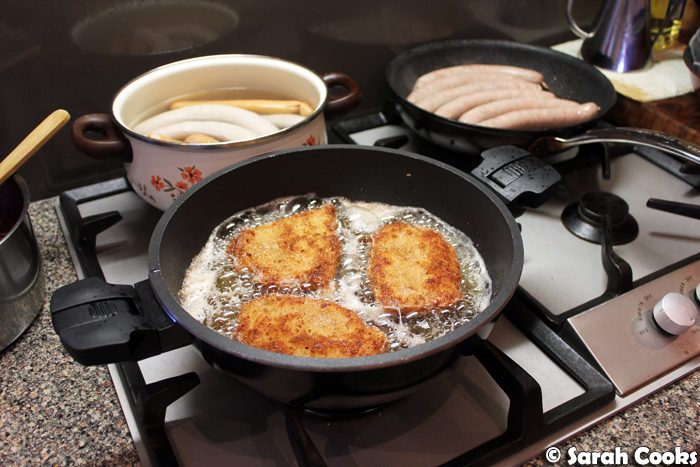 Schnitzels are schnitzels, just cook them in a pan. A heavy based pan is best, like the one you see in the picture above. I also like to take the advice of Austrian chef Sarah Wiener, who says: "Sie müssen im Fett schwimmen!" (They must swim in the fat). I love cooking schnitzels! They were actually one of the first things I taught myself to cook (as well as pancakes and mustard chicken). I was really pleased that these ones turned out so crisp. 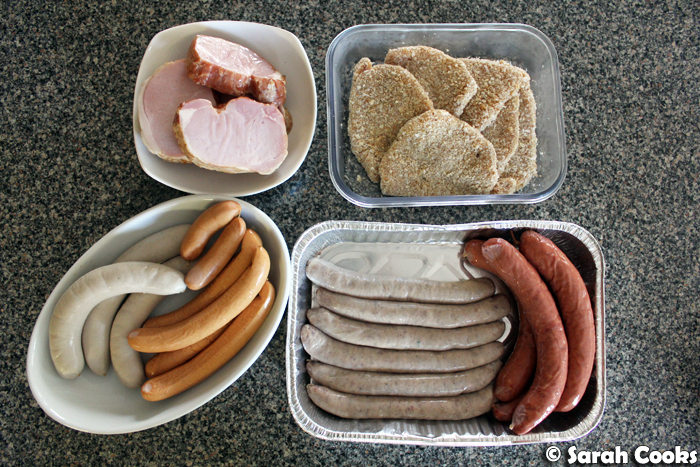 As you can see, some of the skins on the Weißwurst split, but they still tasted good. I find that Weißwurst can be divisive - their perfectly smooth filling can be a bit offputting for some people; I love it. (It's kinda like a Chinese fishball). The Weißwurst skin is edible, but most people peel it off. Bratwurst on the left! I gotta be totally honest, we weren't particularly impressed by Wursthütte's Bratwurst - the flavour was fine, but they kinda stuck and fell apart in the pan. Even though we love their smoked sausages and other cold cuts, the Bratwurst weren't quite up to that high standard. (I can heartily recommend the pork sausages from Peter Bouchier for when you're in the mood for a Bratwurst! 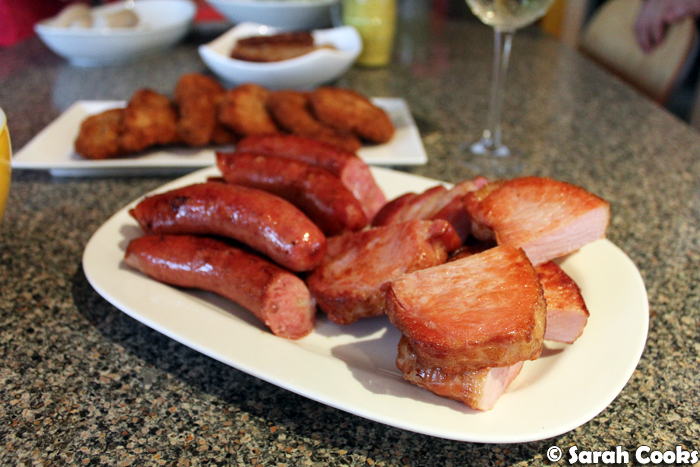 They also do some great smoked German-style sausages and cold cuts too - def worth a visit). You can (just) see the Rotkraut (red cabbage) in the above photo. I've told you about this numerous times before, but it's a classic German side of sautéed red cabbage (you can get the cabbage, already sliced, in jars or packets, which makes the whole process much faster and easier, with results equally good to cooking it from scratch). You cook some onions in butter with a little flour, add the packet of red cabbage and cook until heated through. Done! 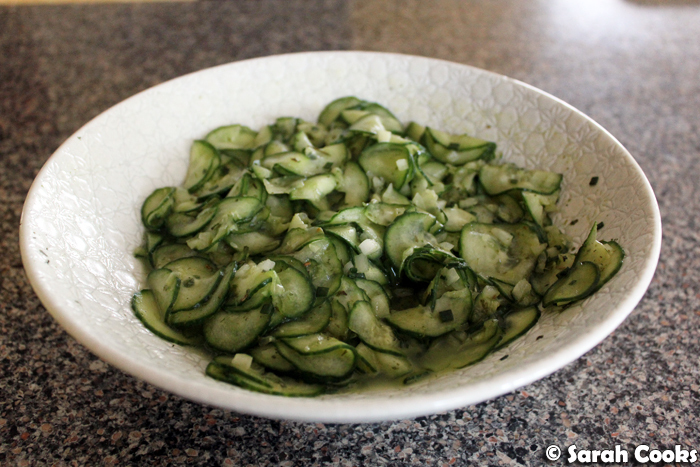 In addition to the warm cabbage, we wanted a refreshing salad - so a Gurkensalat / cucumber salad it was. The dressing was a mixture of finely chopped onions, white vinegar, fresh chives, and a little packet of Salat Kronung (dried salad herbs). We stock up on these when we go to Germany, but obviously if you were making this at home you could use whatever herbs you like. Delicious. And that was the meal! It was quite the epic feast! I gotta say, I was worried we'd overbought, but we actually ate almost all of the meat. Great job team! Although in retrospect, this shouldn't have come as a surprise - in our group of nine, there was one German, two hungry young guys with big appetites, one pregnant lady, three members of my own (Malaysian) family, another Malaysian girl, and one three year old girl who loved the Frankfurters! That food never stood a chance! We did need a bit of a break before we moved onto dessert though. We made two! 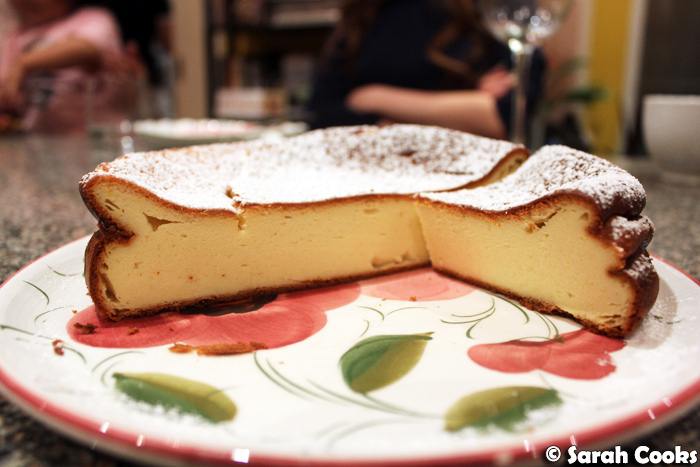 First up was a traditional German cheesecake - recipe previously written up here as the "Awesome German Cheesecake". This is a really light cheesecake, based on quark, with a nice citrus tang. 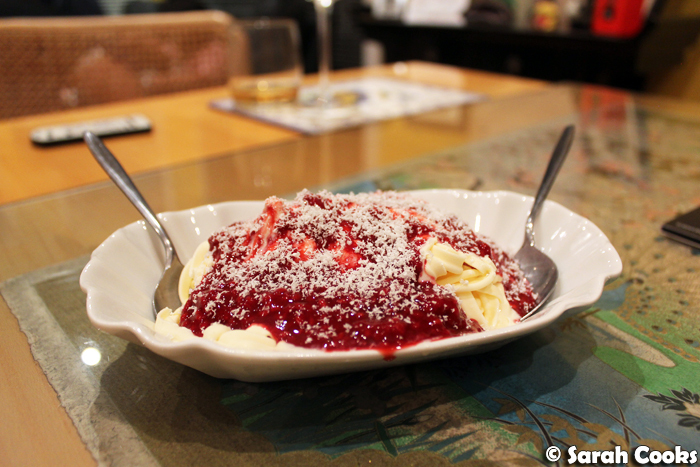 And our second dessert was a fun one, which we were sure our guests would never have seen before - Spaghetti-Eis! This ice-cream treat is one of my favourite things to order at the Eiscafe in Germany. It's an ice-cream sundae in the shape of spaghetti bolognese! 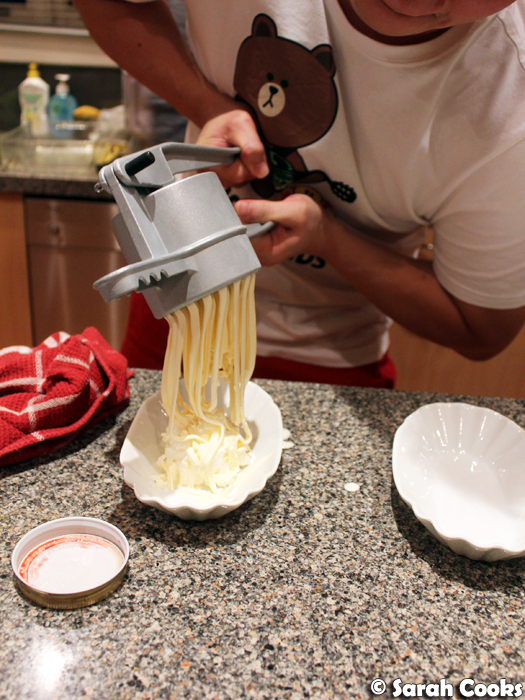 They have machines to make it at ice-cream parlours, but at home you can make it with a Spätzle-press (or potato ricer). Start with some whipped cream in the serving plate, then press your vanilla ice-cream over it. (Heads up, it's hard work). 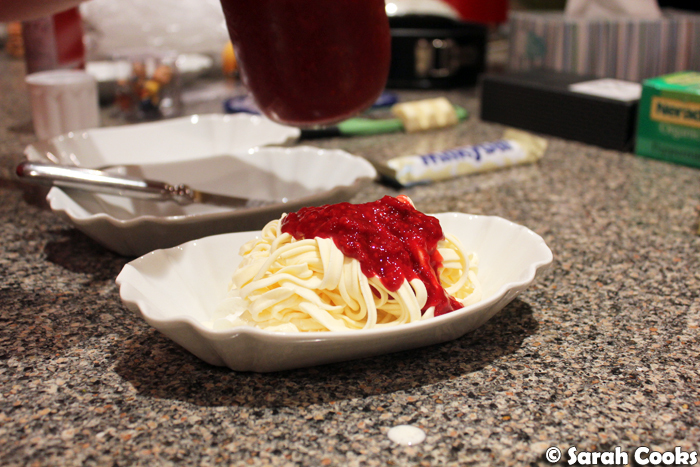 Then pour some raspberry sauce over. (Sandra made the raspberry sauce from scratch, cooking frozen raspberries in a pan and then blending them with a little sugar). Finally, sprinkle grated white chocolate over the top. Ta-dah! It was a great dinner! It was so fun sharing our favourite German dishes with our friends. Looks like a professional German kitchen! But I guess you have a real German hausfrau - looks amazing! Hehe, thank-you! I suppose I do! I must say, my Hausfrau has made me much more efficient over the years! I am soooo impressed by your home-made Spaghetti-Eis! Who can resist a sausage fest eh? Not I!